This venue was built in 1891 and was originally a New York City coffee factory and manufactured smoking pipes. Newly renovated in 2010 the interior has been transformed into an event venue that is not only flexible but large enough to hold all of your guests in 3200 square feet of space. With its pre-war details like high ceilings, exposed brick, hardwood floors and wooden beams, it’s large windows provides spectacular views of Brooklyn including dumbo triangle park. 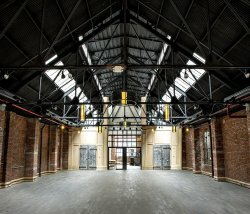 These venues are affiliate events spaces to The Dumbo Loft and are located in the Williamsburg section of Brooklyn. The W Loft provides a wonderful setting for any corporate, wedding or social event. This glass building provides scenic waterfront views of the Manhattan skyline and can be a blank canvas with unlimited possibilities for decorating. This venue appeals to couples planning a classy, modern wedding because of it’s clean, adaptable design. For a larger wedding or event, the Greenpoint Loft is a multipurpose venue that was originally a pre-WWII era warehouse and has been restored to its original raw appearance. 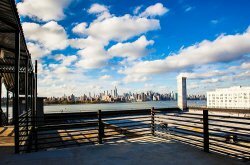 From the exposed high beam ceilings to the wooden floors and open window skylights, this Brooklyn venue boasts a magnificent view of the Manhattan skyline overlooking the Hudson River. This venue is another blank canvas providing the perfect backdrop for the wedding of your dreams, as well as a corporate or social event. 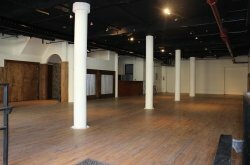 Many couples choose to plan their wedding at the Dumbo Spot, a new ground level loft that can be rented out individually, or as an additional space to the Dumbo Loft for larger events requiring extra room. This 2500 square foot space has large, white walls and wood floors, making it the perfect blank canvas to design into a wedding that is as unique as the couple planning it. With old New York charm, the Dumbo Spot works well for smaller formal functions. This Brooklyn wedding venue is a former metal factory that boasts original brick walls, large wooden doors and a magnificent high ceiling that highlights the buildings industrial past. It can seat up to 275 guests and is the newest venue that is part of the Dumbo Loft family of wedding and event venues in Brooklyn. Jacques Exclusive Catering has been a long-time Brooklyn wedding and event caterer with experience in catering these and other fine New York City venues. Our full-service catering can include all your event needs for rentals, wait-staff, and food, and provides a convenient, easy way to plan for your wedding day. In addition to our rentals, we also provide bar and liquor with licenses in New York and New Jersey. We truly are a one-stop-shopping for everything you need for your special event. For more information on catering to the Brooklyn area or any of these venues, please contact us today.